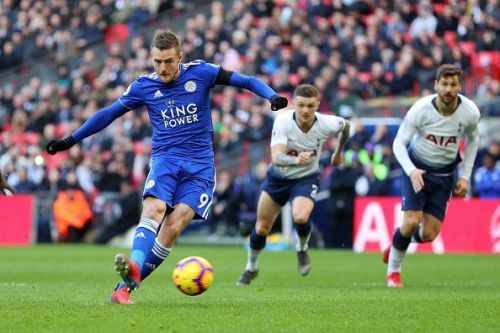 Much to his frustration, Jamie Vardy was left on the bench in a huge clash between Leicester City and Tottenham, and the Englishman saw his team go a goal down in the first half. In the 60th minute, the team finally won themselves a penalty, a golden opportunity to level the score and have a chance to grab a point. Claude Puel sent Vardy onto the field at last, but the English striker's shot was accurately saved by Hugo Lloris. The World Cup winner dived to his right and punched Vardy's shot out of the danger zone. It was certainly a nightmare start for the substitute. Three minutes later, the Lilywhites doubled their lead thanks to Christian Eriksen. Soon after, the 32-year-old had the chance to atone for his mistake, but Lloris once again pulled off an incredible save to keep the scoreline in favour of his side. Fans slammed Puel's decision to let the striker take the important penalty for his first touch of the game. On any other day, he could certainly have done better than that. Since the 2015/16 season, Vardy has scored 14 penalties and missed three in all competitions. He scored Leicester's first goal in the 75th minute, however, as Leicester continued to attack. The Foxes were close to finding an equaliser, but they just came up short.. Son Heung-min scored in added time to seal the victory for Mauricio Pochettino's side, effectively ending Leicester's hopes of getting a draw. If Vardy had scored his penalty, the game could have gone differently, and here was how fans reacted to his penalty miss. That was incredible. Vardy runs straight on to the pitch, takes the penalty, and misses. If he had kept on running after missing, and immediately left the stadium, it would have been utterly perfect. 58:43: Jamie Vardy comes off the bench. 59:28: Jamie Vardy's penalty is saved. Vardy on as a substitute to take the penalty - and Lloris saves. That's just crazy to let a player just on take it. Remains 1-0. This is not a drill, Hugo Lloris has saved a penalty! Jamie Vardy comes off the bench and his first touch is the penalty. Lloris guesses correctly, dives to his right and palms it away. Idiotic decision to allow Vardy to take it after just coming on. I really felt for Vardy when he came off the bench to miss that penalty against Spurs. He copped a bit of flak for it but listen: if the goalkeeper hadn’t saved it then, for me, it’s a goal. Those are the fine margins you deal with in football. Put the football on and was delighted to watch Vardy subbed on to take a penalty and subsequently miss it with literally his first kick of the ball. Wonderfully hilarious stuff!